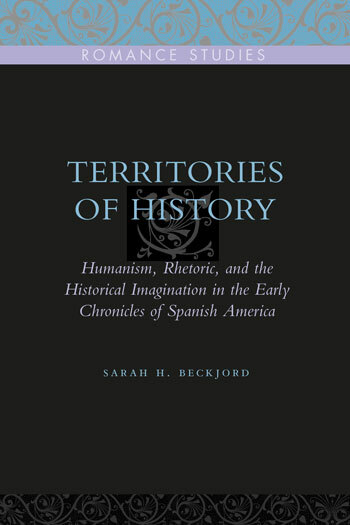 Sarah H. Beckjord’s Territories of History explores the vigorous but largely unacknowledged spirit of reflection, debate, and experimentation present in foundational Spanish American writing. In historical works by writers such as Gonzalo Fernández de Oviedo, Bartolomé de Las Casas, and Bernal Díaz del Castillo, Beckjord argues, the authors were not only informed by the spirit of inquiry present in the humanist tradition but also drew heavily from their encounters with New World peoples. More specifically, their attempts to distinguish superstition and magic from science and religion in the New World significantly influenced the aforementioned chroniclers, who increasingly directed their insights away from the description of native peoples and toward a reflection on the nature of truth, rhetoric, and fiction in writing history. Due to a convergence of often contradictory information from a variety of sources—eyewitness accounts, historiography, imaginative literature, as well as broader philosophical and theological influences—categorizing historical texts from this period poses no easy task, but Beckjord sifts through the information in an effective, logical manner. At the heart of Beckjord’s study, though, is a fundamental philosophical problem: the slippery nature of truth—especially when dictated by stories. Territories of History engages both a body of emerging scholarship on early modern epistemology and empiricism and recent developments in narrative theory to illuminate the importance of these colonial authors’ critical insights. In highlighting the parallels between the sixteenth-century debates and poststructuralist approaches to the study of history, Beckjord uncovers an important legacy of the Hispanic intellectual tradition and updates the study of colonial historiography in view of recent discussions of narrative theory.